I ask you: is this something you put in a bathtub when the expecting woman of the house is plodding in there at all hours of the night? What's worse, after my heartrate returned to normal, why didn't I pull it off the wall so it wouldn't scare me all over again two hours later? My mother cackled a little too heartily when I fussed at her this morning. "It only cost a quarter, and I knew Andrew would love it." Tell your mom that it costs more than a quarter to deal with a coronary, LOL! Me...I would have found him fascinating. 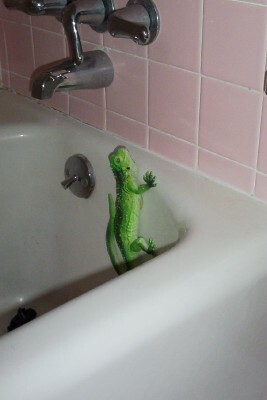 And I would have wondered how he got into my bathroom in the first place...until I realized it was real. Hey, your tiles and tub look just like ours! (We live in a 1960ish bungalow.) Amazing.